Hello and welcome back to another update of Forgotten Hope. 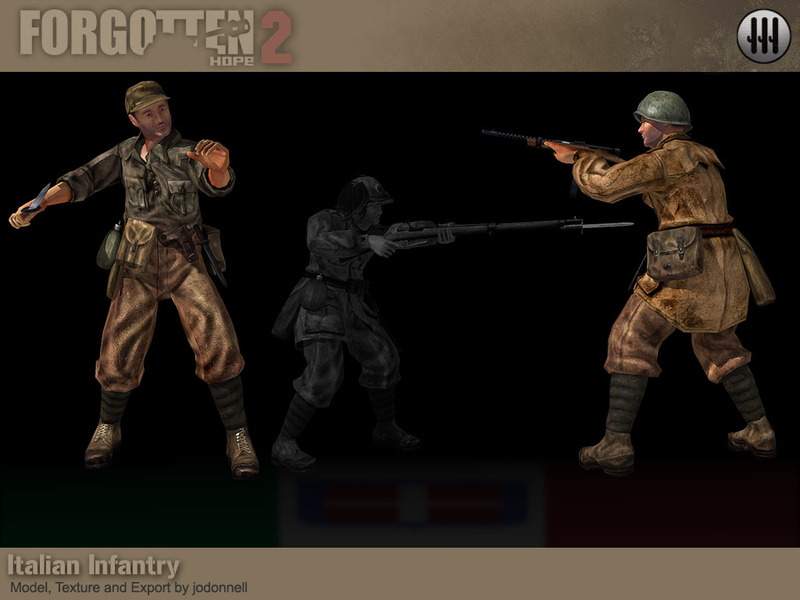 Today, we can finally show off our Italian player models as they now have their own helmets, hats, bags and pouches. We also have two new weapons for the allied forces in Normandy. 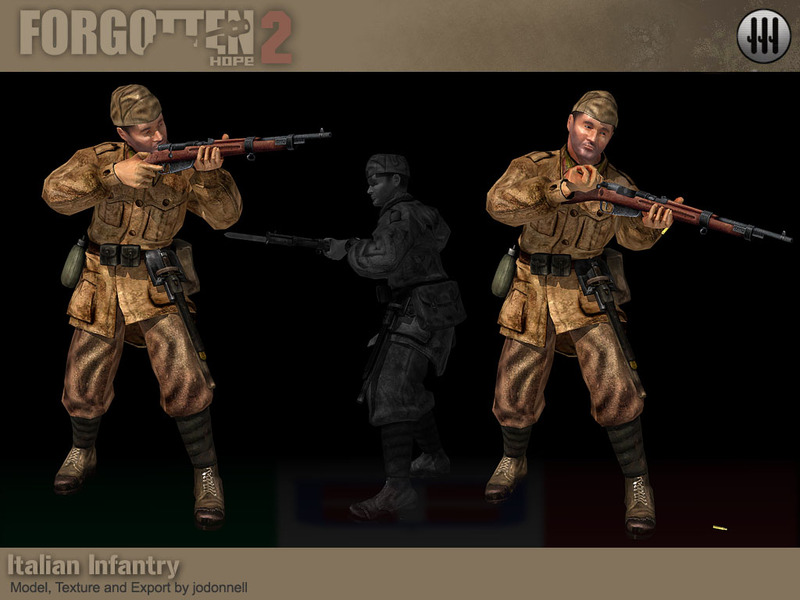 You have probably already noticed our Italian player models in Forgotten Hope 2.0 and 2.1, but we never showed them in any of our news updates because they were still missing much of their own equipment. They were still using German helmets, for example. In the upcoming 2.15 patch we are getting rid of all these placeholders. 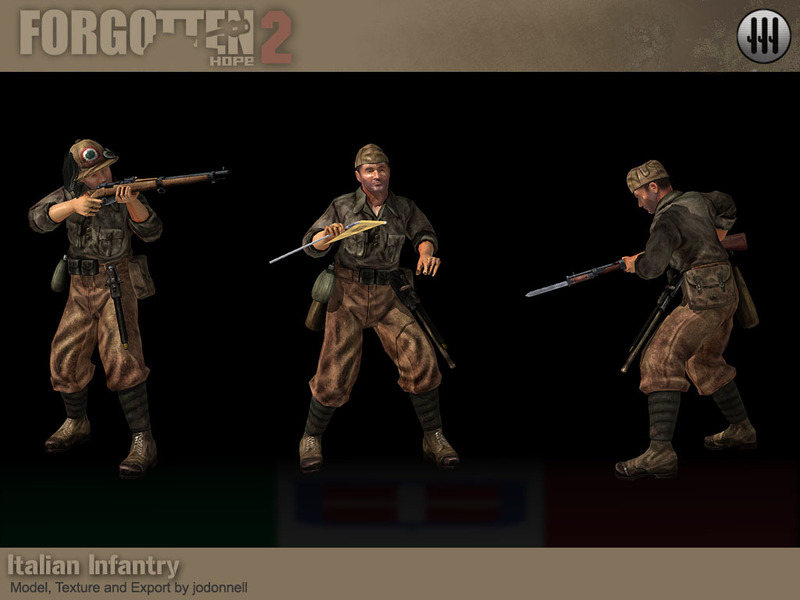 We have already shown the new Italian weapons in an earlier news update, now here are the finished Italian player models. 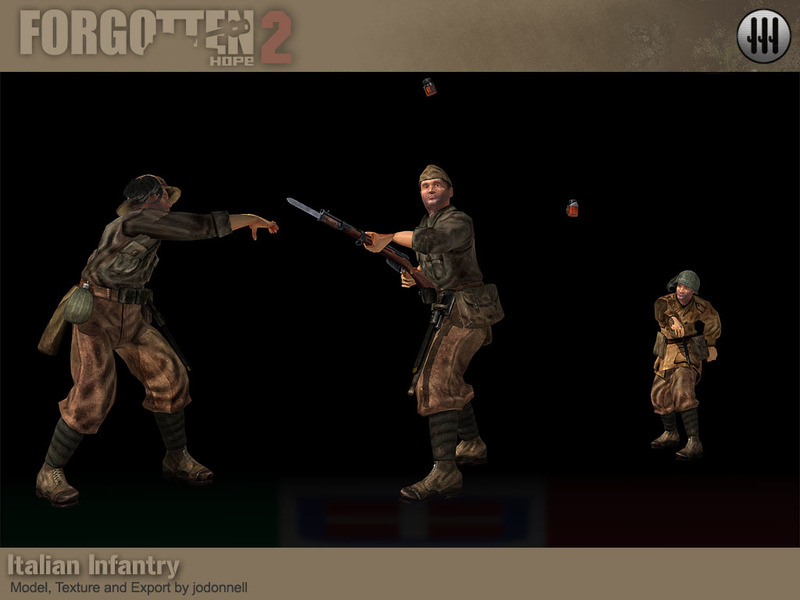 These Italians soldiers were all modeled, skinned and coded by Jodonnell. Next up are the two new allied weapons for Normandy. First up is the US Browning Automatic Rifle or BAR for short. 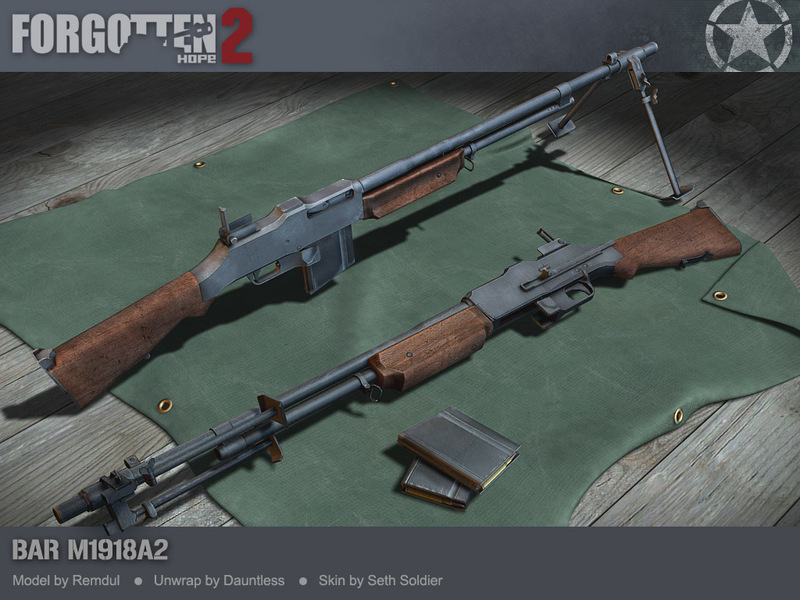 This gun was modeled by Remdul and Dauntless and skinned by Seth Soldier. The BAR first entered service in September 1918, during World War 1. Its use was very limited, as the war was over two months later and the US military was afraid the BAR would fall into enemy hands. The idea behind the BAR was that it would be able to provide advancing soldiers with suppressive fire, a role for which the ordinary machinegun was far too heavy. In World War 2 however, the role of the BAR changed to that of a squad light machinegun. It performed poorly in this role compared to the light machineguns of other nations such as the Bren, because it only had a magazine capacity of 20 rounds and no replaceable barrel. The final version of the BAR, the M1918A2, was introduced in 1940 and had a bipod, flash hider and the ability to switch between two different rates of fire. The BAR continued to be used after World War 2, even seeing limited use in Vietnam. 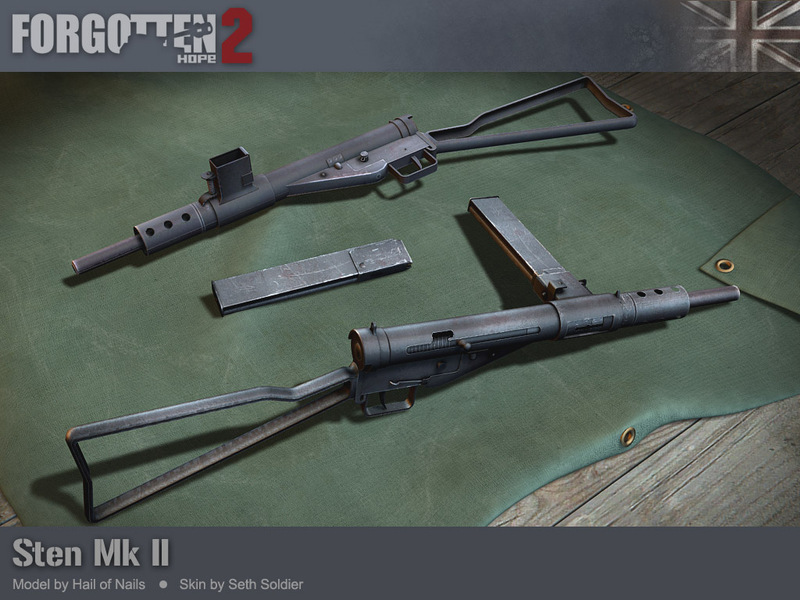 Finally we have the British Sten, modeled by Hail of Nails and skinned by Seth Soldier. After the evacuation from Dunkirk in 1940, the British army was in desperate need for more submachineguns. The Thompsons purchased from the US were too expensive and too few to arm the necessary divisions needed to fight the Germans and Italians. In 1941, this led to the introduction of the Sten (an acronym for Shepherd, Turpin and ENfield). The main focus of the Sten design was to have it cheap and easy to produce and although it covered these conditions excellently, it proved to be prone to jamming, especially if not properly maintained. The mid production Stens were also notorious for their accidental discharges if dropped while cocked. Perhaps the most famous example of the Sten's unreliability is the 1942 assassination of Reinhard Heydrich in Prague, during which assassin Jozef Gabcik's Sten immediately jammed, not having fired a single shot. Later versions of the sten were much more reliable and they continued to serve in the British army until replaced by the Sterling in the 1960s. ModDB: From your recent media updates, it is evident that the team are working hard on the upcoming 2.15 patch. I understand the Tiger Tank has made its way in-game as well as some of the German & Italian weaponary. What are the main changes/additions we can expect to see in the upcoming release? 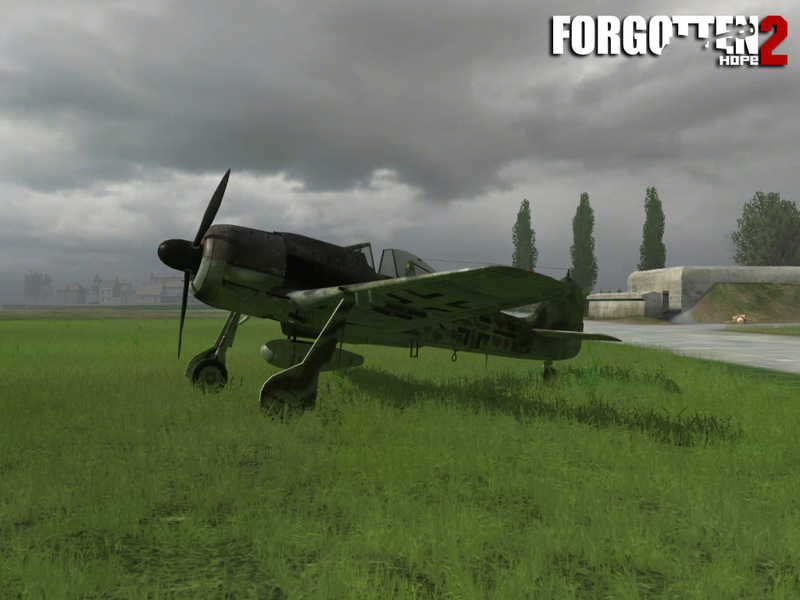 FH2: Aside from the inclusions of the Italian Army and the Tiger tank, we are working on a new HUD system that will be better suited to a WWII shooter than the standard BF2 comrose. Also, we have introduced a grappling hook kit in the map "Giarabub" to make room for some real LRDG (Long Range Desert Group) assaults! You can read the whole interview here: Forgotten Hope 2 Moddb Interview. The first render for today is one of the Grappling hooks we spoke about in the Mod DB interview. 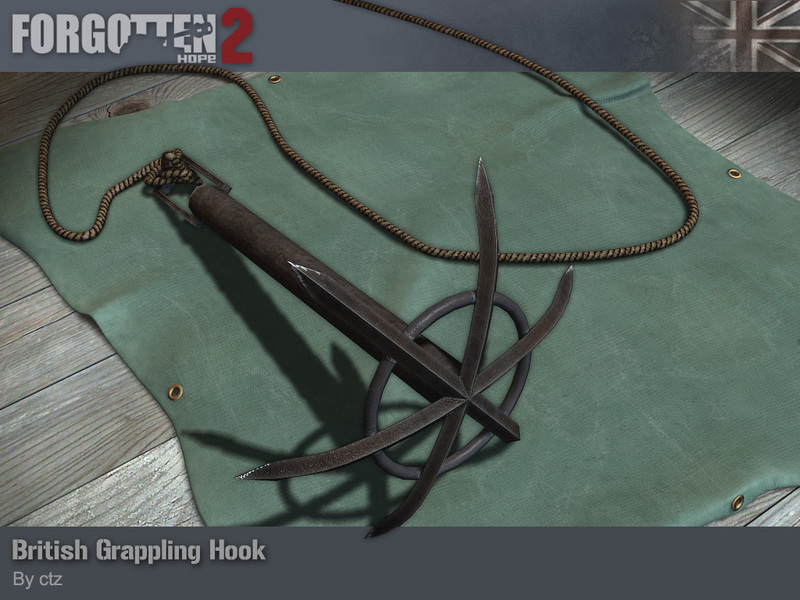 This British grappling hook was modeled, skinned and coded by ctz. You will be able to find this grappling hook in special commando kits, which are usually limited to one per team and only appear on certain maps. 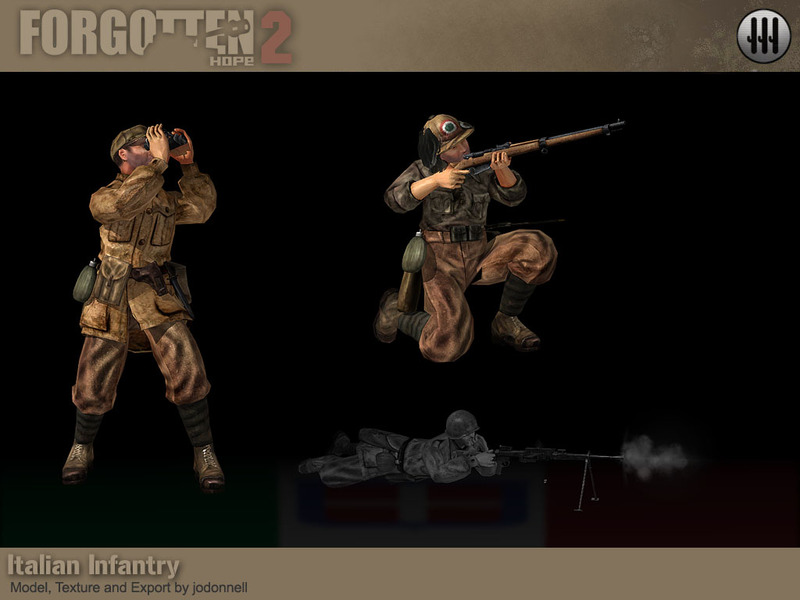 You can use it to climb onto objects that are out of reach for other soldiers to gain excellent outflanking positions. Although only the person with the special kit can throw and pick up the hook, once it's in place, anyone can use it to climb up and down. 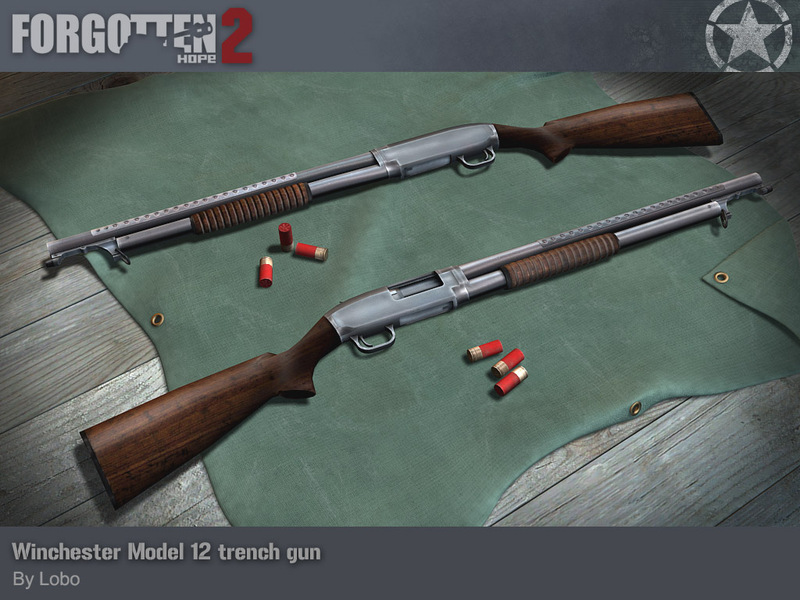 Next up are renders of the famous M1 Garand, by Seth Soldier and Winchester Model 12 trench gun, by Lobo. 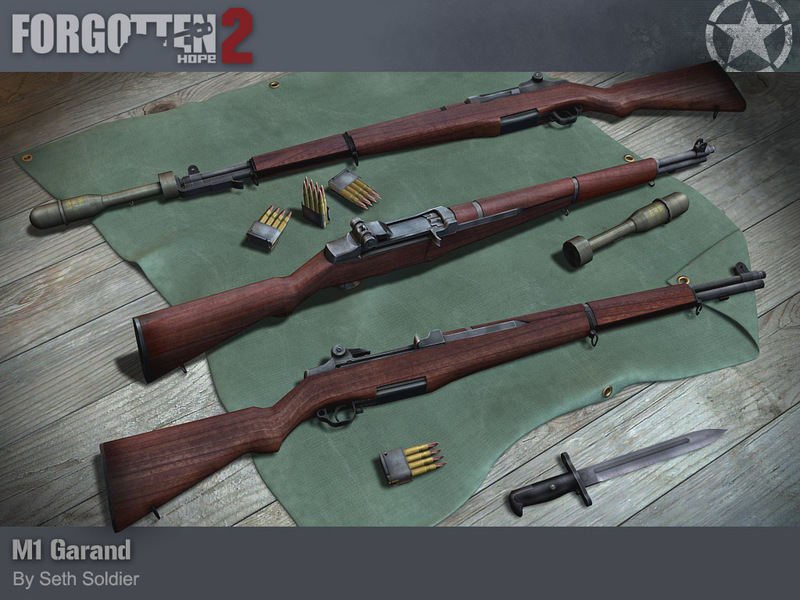 The M1 Garand is probably one of the most famous allied weapons of World War 2. With over 5.4 million produced this is no surprise, but it was also the main rifle of the US army, where as all other nations only used semi-automatic rifles as a supplement to their main bolt-action rifles. It was designed in 1932 and officially adopted by the US military in 1936, but it wasn't until 1941 that the entire army could be equipped with them. As the war was raging on in Europe, sufficient numbers of M1s had to be produced and in early 1940 as many as 600 rifles could leave the factory in a single day. The M1 Garand used .30-06 rounds in 8 round clips and had an effective range of 500 yards. The Winchester Model 1912 "Trench Gun" had proved extremely effective in the First World War at clearing out trenches. In the Second World War it was a lot less effective, as the ranges at which the combat took place were a lot larger. Nevertheless, The Winchester M12 still saw extensive action in the Pacific, where combat ranges were a lot closer than in Europe. Although in small numbers, the M12 was used in Europe, but mainly by military police. 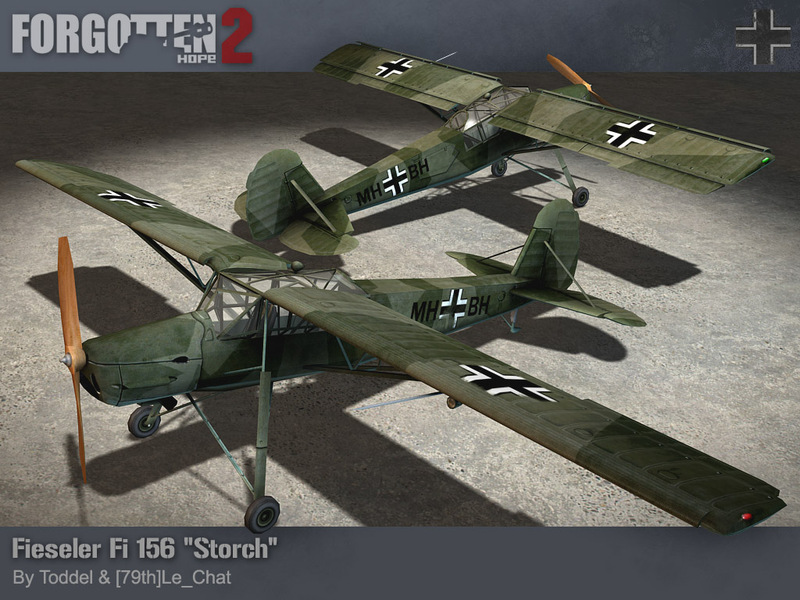 Finally, we have some in game screenshots of the Focke Wulf 190 and Fieseler Storch 156, of which we showed the renders in previous updates. Hello and welcome back to another update of Forgotten Hope. 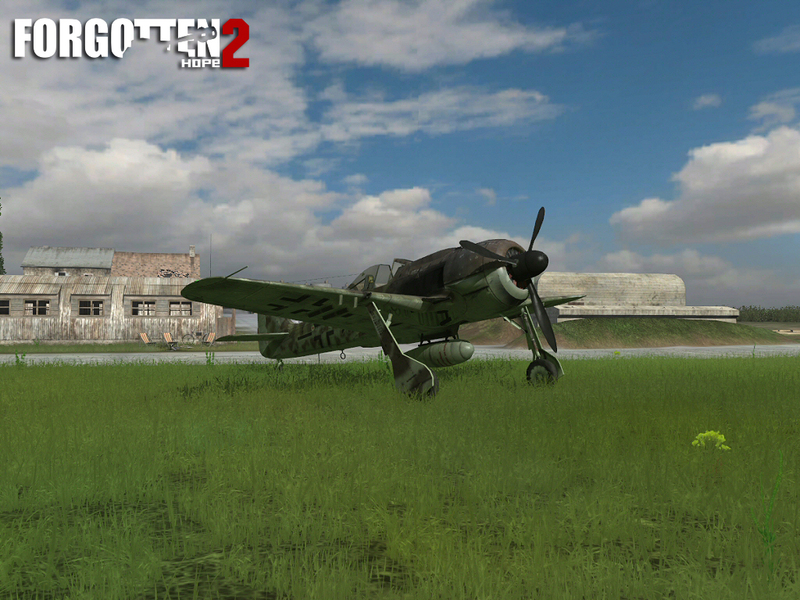 This week we are showing another three German vehicles for Normandy. 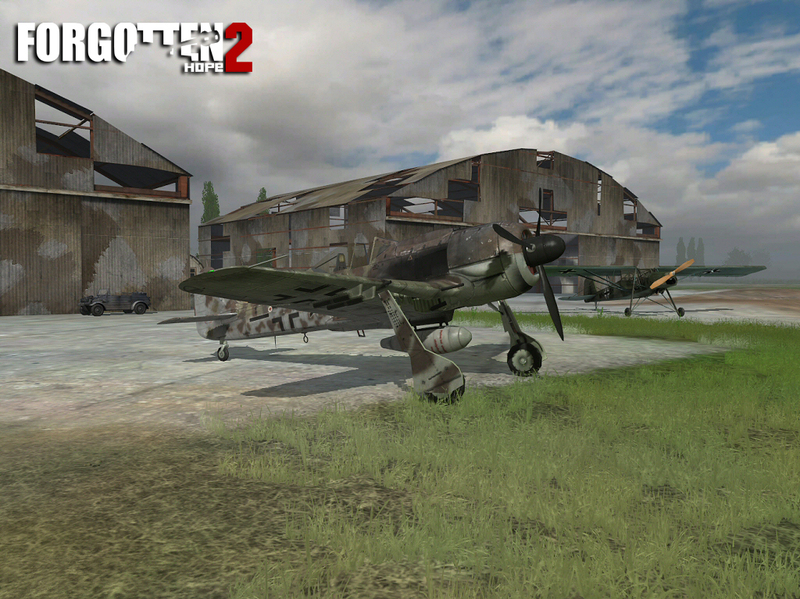 We also have an advertisement for an FH2 mappack from the guys at World at War. 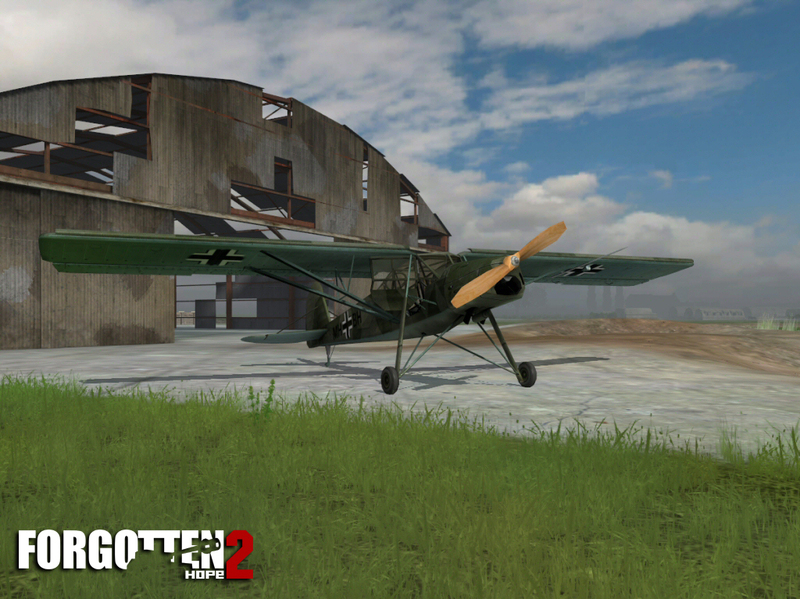 The first thing we would like to show today is the new Normandy skin for the German recon plane, the Fieseler Storch. 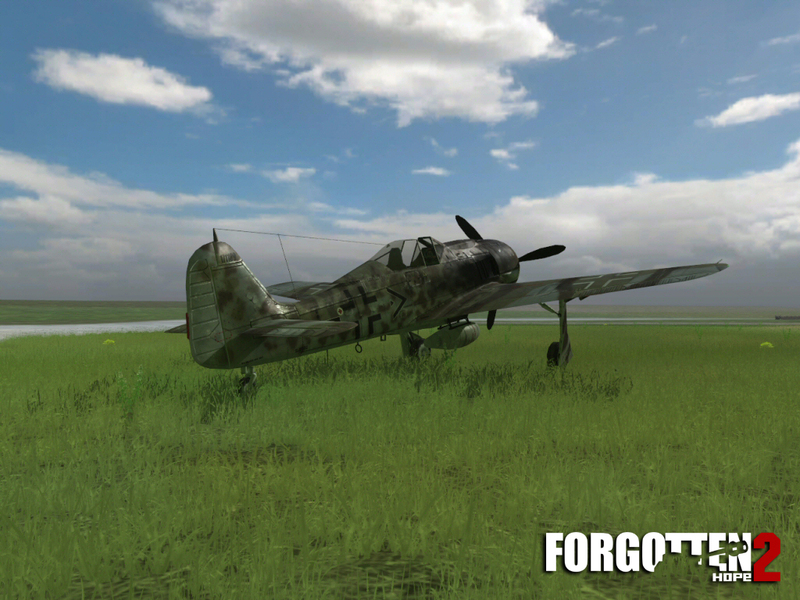 This plane was modeled by [79th]Le_Chat and skinned by Toddel. By June 1944 the Luftwaffe on the western front had been largely annihilated. The constant bombing of airfields and complete allied air superiority meant that there wasn't much that could be done to counter the allied advancements. Although these conditions obviously put restrictions on the use of planes in general, the Storch it was still used in Normandy. Its main special quality was its very short take-off and landing distance. The Storch could land in only 30 metres and take off in 80. 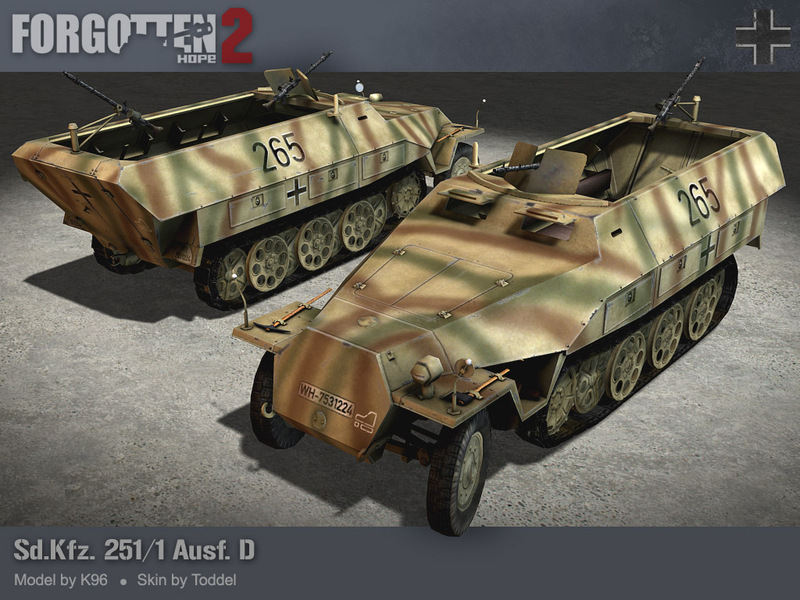 The second item for today is the new version of the German APC - the Sd.Kfz 251/1 Ausf. D. (You've already seen the Ausf. C in Forgotten Hope 2's desert maps.) 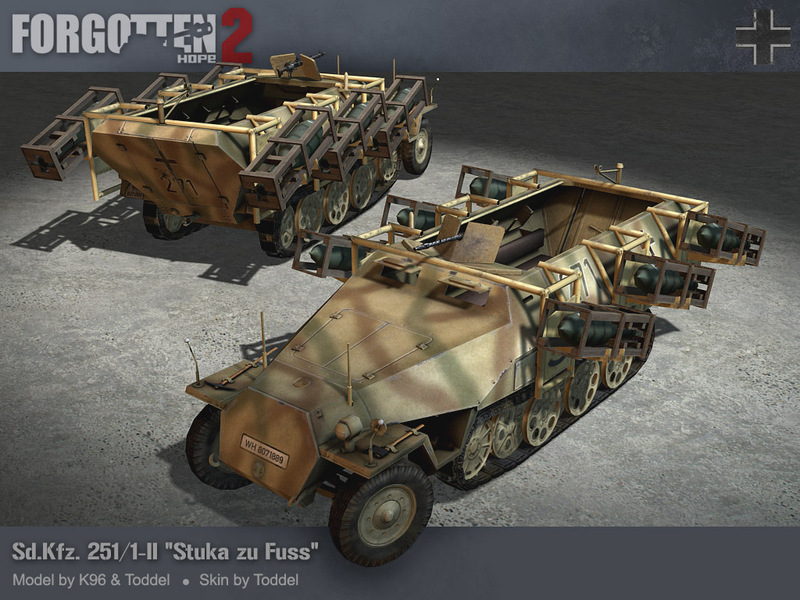 These half-tracks were made in as many as 23 specialised variants and one of those is our third news item - the Sd.Kfz 251/1-II "Stuka zu Fuss". Both those models were made by K96 and Toddel. As the tide of war turned against Germany it was forced to redesign many of its vehicles and weapons to make the production process shorter and less resource consuming. A good example of such a vehicle is the Sd.Kfz 251 Ausf. D. The first of these vehicles was produced in late 1943 and compared to its predecessor the Ausf. C it had a much simpler design. The Ausf. D was by far the most numerous of the 4 Sd.Kfz 251 versions with more than 10,000 produced. The Stuka zu Fuss (Stuka on foot) is quite simply an Sd.Kfz. 251/1 with 6 rocket-launching frames attached. It could fire 280mm high-explosive rockets or 320mm napalm rockets. To aim the rockets one had to turn the entire vehicle, as the frames could only be turned vertically. Since the vehicle did not have a roof to protect the crew from the rocket blast, they had to leave the vehicle and launch the rockets from a safe distance. The wurfger�t 40 rocket launcher (the type mounted on the Stuka Zu Fuss) was nicknamed the "Heulende Kuh" or "Bellowing Cow". The World at War (WaW) Tournament is proud to announce the first community map pack for Forgotten Hope 2. Many of the great custom maps featured in the tournament have been brought to the masses in this map pack which features six outstanding maps. 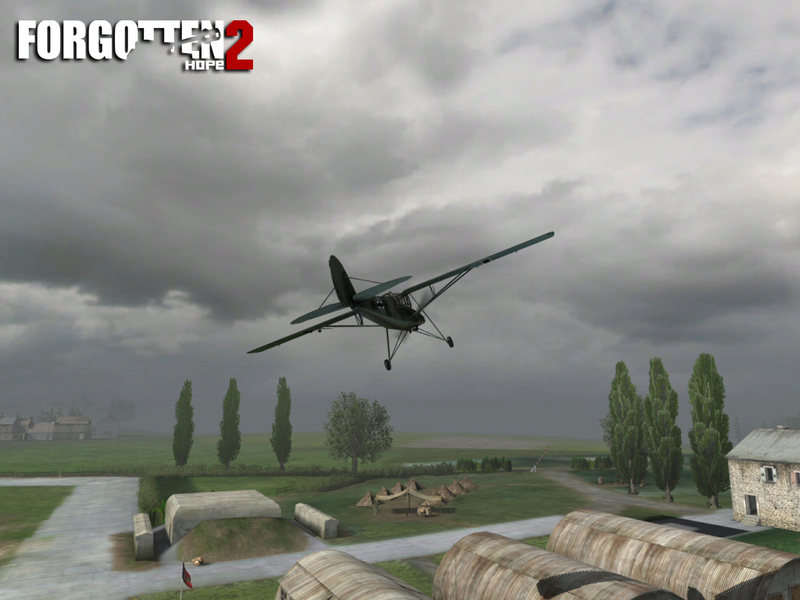 The maps feature great gameplay and many lush forests and abundant grass. If you are tired of getting sand in all the wrong places be sure to give this map pack a try. You can download the server and client files for the map pack at http://www.bfewaw.com/map.